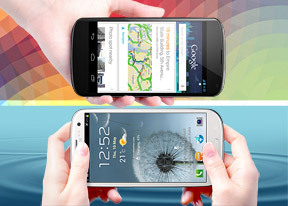 The Samsung Galaxy S III has a reputation to live up to (the S II had one of the best mobile phone cameras of its time), while the Google Nexus 4 isn't burdened with such high expectations, despite the move to 8MP. Google still managed to cause excitement with one of the coolest camera features we've seen recently - the Street View-inspired Photo Spheres. The S III's camera app, along with the rest of the software, is loaded to the brim with all sorts of features - but it only does "regular" panos. Let's take a quick look at what each camera has to offer. The Nexus 4 brought another major improvement - the touch anywhere radial menu. We're big fans of quick controls in the browser and this is the same except it works everywhere on the screen. It's great on two counts. First, a tap and a drag is all you have to do to change, say, exposure compensation, while that will take several taps on the Galaxy S III, even if you do pin the exposure compensation setting to the left viewfinder bar. Second, it's unobtrusive - you can use the circle in the upper right corner to operate the settings in the traditional way, plus the taps for the menu don't get in the way of the taps for touch focus or the swipes for getting to the camera roll. Speaking of the camera roll, we also really like the swipe to delete feature. As far as features go, the Nexus 4 offers all the necessities though advanced users might be left wanting more. There's Scenes and HDR mode, white balance and exposure compensation, flash mode and geotagging, along with touch focus. The traditional Panorama mode is still available, but Photo Sphere steals the show. It combines accelerometer and gyroscope readings to guide you through the process, which is quite simple - you aim for the dots and the Nexus 4 handles the rest. The Samsung Galaxy S III uses a traditional smartphone camera UI - a column on the right for the major controls (still/video toggle, shutter key, Gallery shortcut) and a left column for settings. The left column is customizable and you can put four of the most frequently used features. The fifth icon is the settings shortcut, which takes you through a sprawling system of menus and submenus. Don't get us wrong - we love having all these options at our disposal, but getting to all of them can be slow, even daunting for beginners. The list of features is really extensive: Scenes, HDR, geotagging, burst shot mode, face detection and smile shutter, various automatic modes (best face, best photo, beauty shot), effects and social features like Share shot. There's a list of manual controls too: exposure compensation, white balance, contrast, ISO, focus metering and auto-focus modes. While the Galaxy S III can't match the Photo Sphere feature, its own panorama mode is quite good. But there are a number of features that the Nexus doesn't even come close to. Burst shot takes multiple photos in quick succession (3.3fps). You can use Best photo and Best face to pick the keeps. Best photo automatically picks the best of 8, while Best face keeps track of faces and will stich a composite photo with the best facial expression for each person. It picks each expression automatically (avoiding shots where the person is blinking), but you can manually select a face too. The Samsung Galaxy S III can snap full-res photos during video recording. The Nexus 4 can do the same, but its photos come out in 1080p resolution (2MP) - basically a frame from the video and not of much use. The Galaxy S III photos are shot at 6MP resolution, the maximum in 16:9 mode. Then there's the social aspects of the camera - if you've taught the phone what your friends look like (the gallery automatically detects faces and you can link them to contacts), the phone will recognize them immediately after you take a photo and you can tap on their face to get options for sending the photo to the person. To recap, the interface on the Google Nexus 4 is really convenient. It's easy to pick up and very fast once you get used to it. The camera is a bit light on features though, even with Photo Sphere (which will be a great way to wow your Google Plus friends). The Samsung Galaxy S III on the other hand offers plenty of features, though it will take you a while to learn which does what and find the best 4 shortcuts to put in the left column. Photo Sphere is the biggest omission from the feature set, but that could arrive in an update, as a third-party app or even unofficially from XDA-Developers or the like.